The Guitignan plots of Château Biston Brillette belong to the gravel outcrops of Brillette, to the north-east of Moulis. These sites are located within the middle terrace of gravel constituted during the Mindel period ice break-up (approximately 600,000 to 400,000 years ago). This is referred to as Type 3 gravel by the Agriculture Association APIETA. The gravel dates back to Mindel I, contrary to type 3A, or 4, that corresponds to gravel deposited during the Mindel II ice break-up. The filtering nature of this gravel and of its sandy-gravelly colluvium is reinforced by water “respiration” ensured by the presence of ground-water trenches. Thanks to their outcrop relief created by erosion, these sedimentary formations rank among the soils most conducive to elite winemaking. 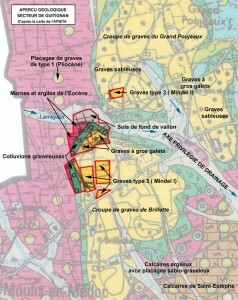 This difference between the types of Garonne gravel would not be important if there had not been a speculative observation stating that all the terroirs of all the Grands Crus classified in 1855 are mainly planted in this type of Mindel glacial gravel. In Moulis, the Mindel I gravel reaches an altitude of 23 metres and is present only on the Brillette and Grand Poujeaux outcrops and on the slopes of Maucaillou. The sector of Petit Pujeaux, or Poujeaux, is marked by limestone from the Late Eocene epoch (38 to 34 million years), clayey-marl limestone and compact or less compact Saint-Estèphe limestone. The Eocene epoch spans from 53 to 34 million years ago and is divided into three periods. The oldest period, Early Eocene, is a generally cold period during which only sand was deposited. The intermediary period, Middle Eocene, with a warm and humid climate, was very fertile in massive limestone beds. The Late Eocene period was more temperate, marked by more clayey limestone and the presence of marl. 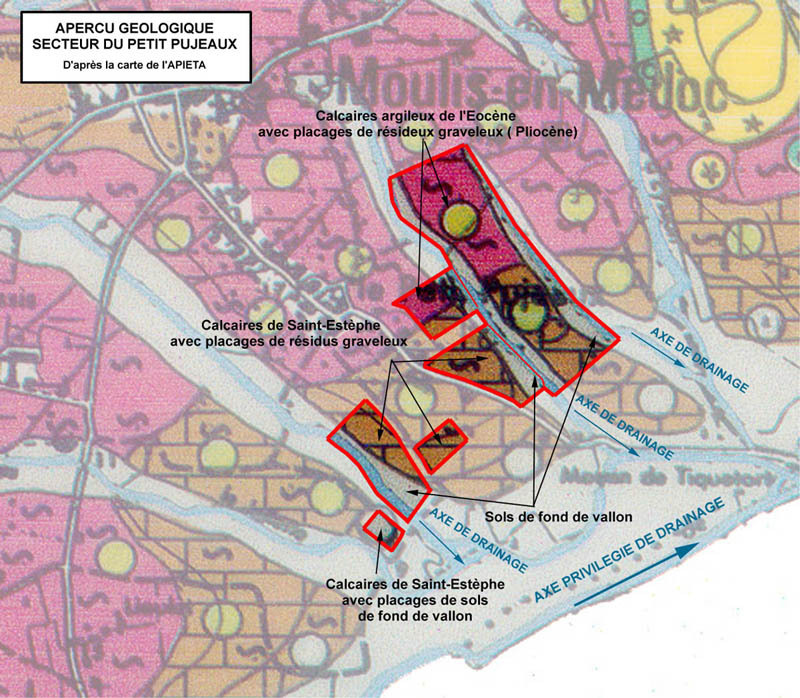 In the Petit Poujeaux area, the erosion caused by the Tiquetorte stream, a major ground-water trench, and its tributaries, dissected the limestone bedrock to form a hand shape. This soil configuration, that is typical of the clayey-limestone base of a gravel terrace, allows natural drainage and ensures good drying of the soil. 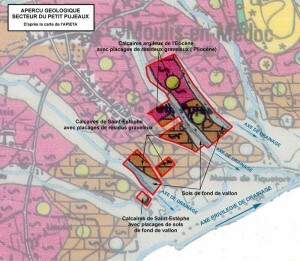 The sites of the Château Biston-Brillette terroirs are located at the bottom of the ledge and the slope of the clayey-limestone terrace of Moulis, from 17 to 9 metres. These terroir sites are conducive to wines of strength and colour. Today, they are the ideal terroir for Merlot, Cabernet Franc and Petit Verdot, in warm regions. With fine wines from gravel soils, these clayey-limestone wines have always been very successful in the past, and still are today.